America’s job market stirred to life in June as payroll growth accelerated by the most since October after a two-month lull, assuaging fears of broader cutbacks by companies. Payrolls climbed by 287,000 last month, exceeding the highest estimate in a Bloomberg survey, after a revised 11,000 gain in May, a Labor Department report showed Friday. The median forecast in a Bloomberg survey called for a 180,000 increase. The jobless rate rose to 4.9 percent as more people entered the labor force. Wages advanced less than projected. The figures will help reassure workers and Federal Reserve policy makers alike that companies are staying the course on hiring in the face of weaker profits and overseas developments such as Britain’s vote to leave the European Union. Even with the outsized June advance, job growth over the last three months averaged 147,000, down from almost 200,000 in the first quarter and a sign of moderation as the economy approaches full employment. Payrolls in leisure and hospitality registered the biggest gain since February 2015, health care providers took on the most workers since October and factories added the most jobs in five months. June payrolls were boosted by the return of 35,100 striking workers at Verizon Communications Inc. Estimates in the Bloomberg survey for total employment ranged from gains of 50,000 to 243,000 after a previously reported 38,000 May increase. Revisions to prior reports subtracted a total of 6,000 jobs to overall payrolls in the previous two months. The unemployment rate, which is derived from a separate Labor Department survey of households, increased from 4.7 percent in May. The labor force participation rate, which indicates the share of working-age people who are employed or looking for work, crept up to 62.7 percent from 62.6 percent. The Labor Department’s underemployment rate dropped to 9.6 percent in June, the lowest since April 2008, from 9.7 percent, reflecting a slump in the number of people working part-time for economic reasons. Some 5.8 million workers, the fewest since October, were in part-time jobs but wanted to be employed full time. Wages improved modestly, with average hourly earnings climbing 0.1 percent from a month earlier. The year-over-year increase was 2.6 percent, less than the 2.7 percent median forecast. The average work week for all workers held at 34.4 hours in June. 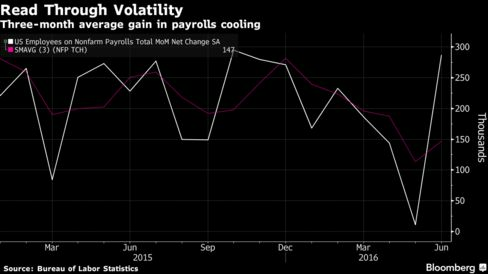 Factories increased payrolls by 14,000 after a 16,000 decline the month before, the latest indication that the industry is stabilizing after damage wrought last year by a strengthening dollar and plunging oil prices. Employment at construction companies was unchanged after falling in May. Among services providers, retailers boosted payrolls by almost 30,000, while employment in health care climbed 58,400. In leisure and hospitality, payrolls jumped 59,000 in June. Governments added 22,000 workers, the most in almost a year. After the U.K.’s June 23 referendum led a vote to withdraw from the EU, policy makers around the world are watching for signs that weakness stemming from the heightened uncertainty is damping growth. Central banks have pledged to support global liquidity levels, and Fed officials say they are closely monitoring the situation. Minutes from the Fed’s June meeting revealed that the policy makers wanted proof that job creation would resume a healthy pace and economic momentum remained intact.